Good news for barflies! Time reports on new research into alcohol and life expectancy, which not only shows that moderate drinkers live longer, but that even heavy drinkers live longer than total abstainers. ...[A]fter controlling for nearly all imaginable variables — socioeconomic status, level of physical activity, number of close friends, quality of social support and so on — the researchers (a six-member team led by psychologist Charles Holahan of the University of Texas at Austin) found that over a 20-year period, mortality rates were highest for those who had never been drinkers, second-highest for heavy drinkers and lowest for moderate drinkers. A key factor here is that the study accounted for the difference between people who never drank, and those who had problems with the bottle and then quit. It still found that moderate alcohol consumption is beneficial. Some manufacturers have started using color codes to distinguish tubes for different functions -- but they've each used their own scheme, thus adding to the confusion! In 2008 California passed legislation mandating that different sorts of medical tubes not be compatible with each other, but the manufacturers’ trade association managed to push back implementation to 2013 and 2014. Scientific American reports on research showing that a diet high in saturated fat causes the brain to become resistant to leptin and insulin, hormones that let us know when our need for food has been fulfilled. The research in question was done on rats, and it's always tricky to extrapolate such work to humans; and there are serious ethical issues with killing rats to find our why humans become such pigs when they eat cows. But the phenomenon in question is expected to apply to humans as well. The researchers also performed in vitro experiments where they directly observed palmitic acid (a common saturated fatty acid) inhibiting the signaling of nerve cells exposed to insulin. On the other hand, oleic acid, a monounsaturated fatty acid, did not produce this result. Science Daily reports on research by health economist Todd Elder that finds that up to close to a million children may be misdiagnosed with attention deficit hyperactivity disorder simply because they are the youngest (and therefore likely to be least mature) in their kindergarten class. Overall, the study found that about 20 percent -- or 900,000 -- of the 4.5 million children currently identified as having ADHD likely have been misdiagnosed. This, of course, doesn't even touch on the kids whose "ADHD" is more accurately described as "Outdoor Exercise Deficit Disorder". NPR reports on a survey of wild rapeseed (better known as "canola" for "Canadian Oil", since someone figured out that "rapeseed" was an ugly word, though it derivies from nothing more offensive than a Latin word for "turnip") that found hundreds of genetically modified plants growing along the sides of North Dakota roads. According to ecologist Cindy Sagers, who led the study, "What we've demonstrated in this study is a large-scale escape of a genetically modified crop in the United States." Moreover, these aren't just plants sprouted from GMO seed that spilled, or blew over from a nearby field: evidence "indicates that these things are probably self-perpetuating outside of cultivation and have been there for a couple of generations at least," according to Sagers. Pro-GMO researchers say there's nothing to worry about because these GMO canola plants won't out-compete wild plants. Which misses the point entirely: if GMO canola is in the wild, it's certainly in canola fields where supposedly non-GMO canola is being grown. Of course no one with a lick of sense who's considered the issue for more than thirty seconds would be surprised at that conclusion. What this study actually shows, however, is just how utterly bad some nutrition research can be. What was this "low-fat" diet like? The supposed low-fat diet had a target of 55 percent of calories from carbs, 15 percent from protein and 30 percent from fat. But 30 percent of calories from fat is not a low-fat diet. The 30% recommendation was based on what was seen as an achievable goal in a fat-addicted culture, not as a health optimum; it's like, "hey, can you cut the cigarettes down to a pack a day?" The average intake is estimated at 35.4% calories from fat in industrialized nations, so 30% is only a little below that. (I've seen estimates that the American average is 45%, but that only shows how fat-addicted we are, not that 30% is low.) In developing nations it's 19.6% -- close to the 20% estimated for Late Paleolithic humans. That's much higher than other primates, and almost certainly well in excess of our needs, but we might call 20% a moderate-fat diet. An actual low-fat diet like the Ornish plan gets around 10% of its calories from fat. (Emphasis added.) So it seems sugar was on the menu, even in high amounts. Meanwhile, the low-carb group got their small ration of carbs from a strictly regimented selection of vegetables, fruits, grains, and dairy. So the "low-fat" diet here was a high-fat, sugar-laden, nutritional nightmare, and the "low-carb" one was an even higher-fat, sugar-free nutritional nightmare. It's not surprising that the low-carb diet, bad as it is, might look good in comparison -- even with the side effects this study found common: hair loss, bad breath, and constipation. And this passes for science? A few days ago I stumbled upon a graph of the obesity rate in the U.S.. It was steadily slightly increasing since the 1960s and then around 1980 (the data points are too sparse to exactly locate the point), there was an inflection point where it started to climb more rapidly. Now, look at this graph of U.S. consumption of sugars. 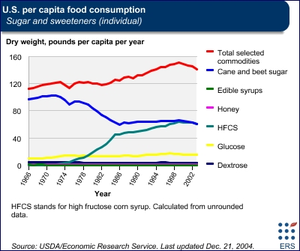 HCFS gets introduced in the 1970s, it's cheap, and so we started to eat more sugar -- increasing our per-capita consumption about 20 pounds a year. Notice the similarity in the shapes of the graphs. Hmm. That 20 pounds works out to extra 25 grams of sugar a day, an extra 100 calories from sugar alone. So sugar itself is only a fraction of how many calories we over-eat -- our caloric intake increased about 25% between 1970 and 2000. But there's a pretty clear link -- put sugar in any food, and we'll eat more of it! Correlation is not causation, as they say; but it does jump up and down and point and say, "Look here! Look here!" I don't know how much of a role subtle biochemical effects involving fructose might or might not play a role on top of increased caloric consumption; the research seems mixed, though I've admittedly only scratched the surface. But the simple fact that food got sweeter, we started eating more of it, and got fat, explains a lot. A study published earlier this year in the Archives of Internal Medicine looked at the effects of nut comsumption on blood cholesterol and triglyceride levels. The news is very good for those of us who are nuts for nuts: looking at data from 583 people in 25 trials conducted in 7 countries, the authors found "the best evidence yet that eating nuts reduces LDL cholesterol and improves the blood lipids profile," according to co-author Dr. Joan Sabaté, chair of the nutrition department at the Loma Linda University School of Public Health. They found a dose-dependent effect where nuts lowered total cholesterol levels, improved the ratio of HDL (good) to LDL (bad) and total cholesterol, and reduced high triglyceride levels. The effect was the same for all types of nuts -- walnuts, almonds, peanuts (botanically, not a nut, but fakes it well enough), pecans, hazelnuts, macadamias and pistachios. They also found that the cholesterol lowering effect is greater then found when nuts replace saturated fats than when they replace olive oil or carbohydrates. Now, there is such a thing as too much of a good thing: nuts are a great source of energy, as any trail-mix chomping hiker knows, so overdoing them can pack the diet with too many calories. The highest daily intake of nuts looked at in the trials reviewed was 132 grams -- 4.66 ounces, which is probably a little high. Sabaté recommends a limit of 3 ounces a day. According to the FDA, "scientific evidence suggests but does not prove that eating 1.5 ounces of most nuts per day, as part of a diet low in saturated fat and cholesterol, may reduce the risk of heart disease." As a snack, I love to cut up an apple or a pear and sprinkle on some almonds or walnuts. It's great raw, or sprinkle on some cinnamon and briefly bake, or heat it up in the microwave for a minute -- yum! Read more about ah, nuts! Surgeon General declares, "Exercise is Medicine"
Policy makers are asked to change policies to support physical activity as a major component of health. Clinicians and fitness professionals are asked to integrate exercise into every patient and client interaction. Communities, workplaces, and schools are asked to promote physical activity as an essential part of health and well-being. Members of the public are asked to educate and empower themselves to seek appropriate counseling on physical activity. As health professionals, we should remember that patients are more likely to change their behavior if they have a meaningful reward -- something more than reaching a certain weight or dress size. The reward has to be something that each person can feel, enjoy, and celebrate. The reward is optimal health that allows people to embrace each day and live their lives to the fullest -- without disease, disability, or lost productivity. I hope you will join the Exercise is Medicine initiative. Together, America can become a Healthy and Fit Nation. Since Benjamin is an Obama appointee, I expect we'll soon hear a backlash from the GOP's wacko wing about healthy people being some hidden Muslim socialist plot. On the one hand, Benjamin has drawn fire for appearing to be overweight; on the other, she's a mountain climber who's training to take on Mount Kilimanjaro. As someone who's clearly "been there" in terms of dealing with excess weight, she might have the moral authority to get us off our fat butts and moving. One can only hope. Read more about Surgeon General declares, "Exercise is Medicine"
These printing technologies rely on paper impregnated with zillions of microcapsules containing ink or dye; pressure or heat breaks the capsules and lets the ink out. (Fun fact: up until 1970, the dye was often made with polychlorinated biphenyls -- PCBs, delightfully toxic chemicals). In some methods, the paper has to be coated with a developer that reacts with the dye; that's where "phenolic resins" like BPA come in.